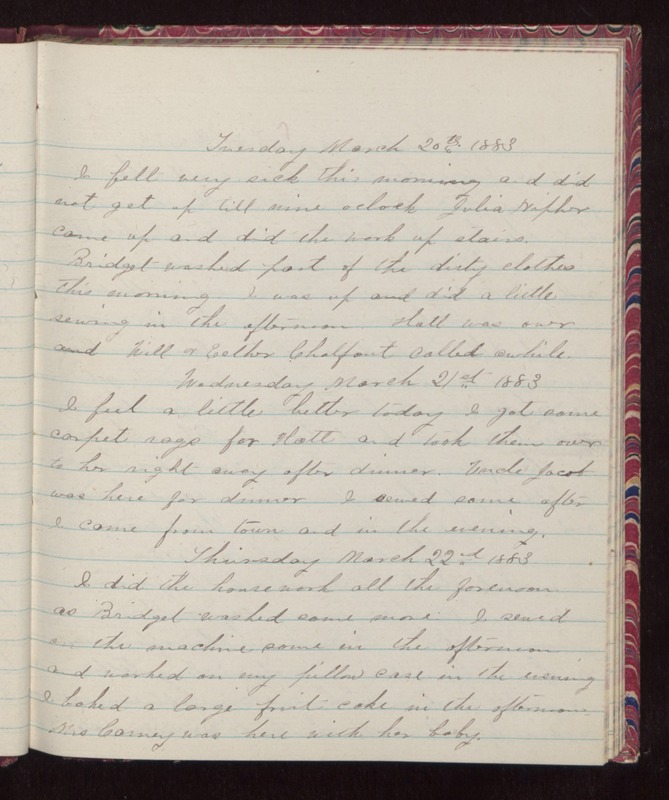 Tuesday March 20th 1883 I felt very sick this morning and did not get up till nine oclock Julie Nipher came up and did the work up stairs. Bridget washed part of the dirty clothes this morning. I was up and did a little sewing in the afternoon. Hatt was over and Will & Esther Chalfant called awhile. Wednesday March 21st 1883 I feel a little better today. I got some carpet rags for Hatt and took them over to her right away after dinner. Uncle Jacob was here for dinner I sewed some after I came from town and in the evening. Thursday March 22nd 1883 I did the house-work all the forenoon as Bridget washed some more. I sewed on the machine some in the afternoon and worked on my pillow case in the evening I baked a large fruit-cake in the afternoon. Mrs Carney was here with her baby.